Home Columns Elizabeth Szlek Phoenix Health: What Are You Craving? Most of us would agree that from time to time we seem to “crave” certain food or drinks. Faced with this, we either go and seek our desired crave, or resist, exercising our iron will. Which approach is better? Neither! Giving in to food cravings can lead to big trouble, depending upon the targeted substance, but on the other hand, cravings are messages from your body. They are a plea for help! But we must be sure we really do help, and not add to the body’s burden. 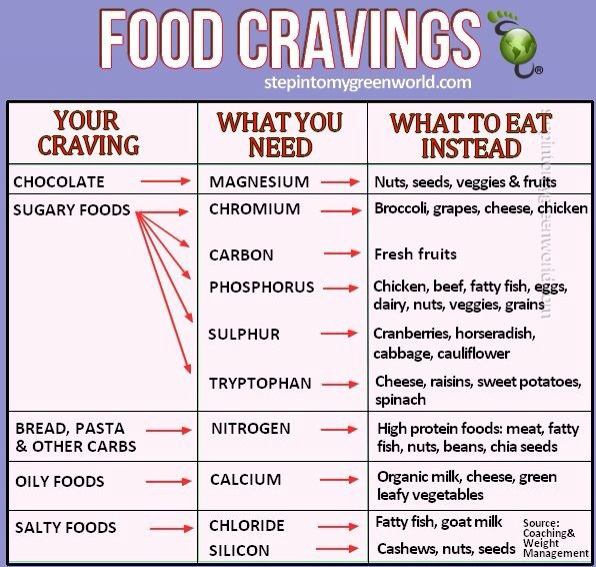 Nutritional therapy practitioners are trained to understand what is going on in the case of cravings, and so we will look at some common ones, and point out what the body is actually looking for. Here’s a little anecdote, though. Last week I saw a client who told me in her initial interview that she never ate salt. What?? Never?? No, never. She never added salt to her cooking. I asked what her husband did since the food would be pretty tasteless without salt. She mimed someone feverishly salting a plate of food. “He just keeps adding more and more salt!” Yes, of course! Then I asked if she ever craved salt. She answered, somewhat sheepishly: “I eat a lot of potato chips…” Potato chips are essentially a salt delivery system. But, what they deliver is usually the bad, industrial salt that no one should be eating. I told her to start salting her food with good sea salt containing scores of minerals the body needs, and she would have both tastier food, and would eventually stop having to eat bags of potato chips to get the salt she craved. Many women find themselves craving chocolate, especially during the days before their period. Why? They need magnesium, which can be found in raw nuts and seeds, legumes and fruits. But, since most people don’t eat a lot of these and are addicted to sugar, they go to chocolate first. Try some seeds, try some lentils! Also, at this time of the month, women generally need more zinc, so again, think leafy greens, liver, seafood and root vegetables. Many people crave sweets, and in fact are quite addicted to sugar. But the message they should be getting is for more chromium ( a trace element used to balance blood sugar), phosphorus and sulfur, and tryptophan. Liver and chicken, lamb, fish, eggs, kale, cruciferous vegetables and dairy are some of the foods the person craving sweets actually needs. But the message has a hard time getting past the sugar bomb. Craving bread or toast can mean the person needs more nitrogen found in high protein foods. So think of a pastrami sandwich – without the bread! Craving coffee or tea may mean someone again needs minerals like phosphorus and sulfur, and iron and salt. Huh! Who knew!! A nice fried egg with sea salt might do the trick! For alcohol cravings, take calcium- and potassium-rich foods like greens, black olives, cheese and even seaweed. If you are craving acidic foods, you probably also need some magnesium, so go for some raw nuts and seeds, legumes and fruits. People who have a poor appetite, on the other hand, are often deficient in vitamins B1 and B3, as well as manganese and chloride. So, again, nuts and seeds, liver and other organ meats, tuna and halibut, beef, pork, chicken, and turkey, plus beans and legumes will do the trick. For those of you trying to quit smoking, you need silicon, found in nuts and seeds, and tyrosine, an amino acid, and you need lots of Vitamin C, green and red fruits and vegetables to help with tobacco cravings. So the rule is, you may be craving something, but instead of eating a food lacking essential nutrients, eat the nutrient-dense foods I have mentioned. Elizabeth Szlek is the Director of The Door Counseling Center of Yorkville. She is a Licensed Mental Health Counselor and a Nutritional Therapy Practitioner, as well as a certified GAPS Practitioner. She can be reached at (315) 768-8900.